A few weeks back, Motorola began the Android Marshmallow soak test for the second generation Moto G. The company has now started seeding the final Android 6.0 update to owners of both the 3G and LTE-equipped variants of the smartphone in India. 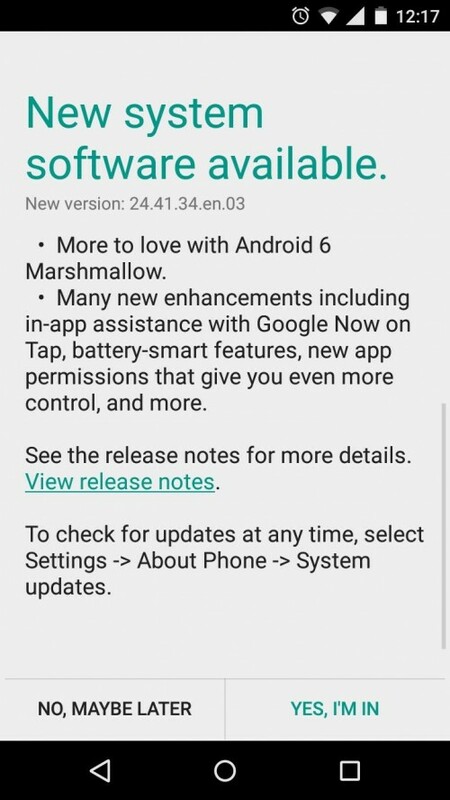 The fact that Motorola chose to release the update in India before other regions isn’t very surprising as the Marshmallow soak test was also first rolled out in India. Currently the update is being pushed out to users via the OTA route in India, so you can expect to receive an update notification on your Moto G 2014 soon if you’re in India. After installing the Android 6.0 OTA update on your smartphone, you will see the software version change to 24.41.34.en.03. In case you have received the update notification on your smartphone already, do make sure that you first connect to a Wi-Fi network before you begin downloading the update. In case you proceed with the update download over cellular data, you will end up incurring high data usage charges. It is also a good idea to install the OTA update only when you have at least 50% battery charge left on your Moto G 2014. In case you install the OTA update with very little battery charge left on your device, the update may not complete successfully if the battery charge runs out before the update installation process can complete. The Android Marshmallow update for the Moto G (2nd Gen) includes a number of new features such as App Standby to reduce battery drain, customizable app permissions, App links, ability to enable SD card to fully extend internal storage, “Do not disturb” button in quick settings, “improved” volume controls, contextual search with Google Now on Tap, Direct Share, and more. The Android 6.0 Marshmallow update for also gets rid of the Moto Assist, Motorola Migrate, and the Motorola Alert features that were present on the previous Android 5.1.1 Lollipop firmware. For more details on the update, you can check out the official release notes at this link.